Last year saw an unprecedented number of women winning their way into the seats of power in politics. Most famous were the record wins in the US midterm elections – these victories will see about 90 women in Washington D.C. this month to sit in Congress and the Senate. Yet another spectacular transformation of the political landscape is taking place in Africa with Ethiopia at the helm following the appointment of Sahle-Work Zewde as the nation’s first woman president. Already in place were the women Vice Presidents of Tanzania (Samia Suluhu) and Zambia (Inonge Wina). Ethiopia’s Prime Minister Abiy Ahmed also appointed Birtukan Mideksa to head the elections board. Mideksa’s peers on the same continent are Priscilla Chigumba of Zimbabwe and Jean Mensa in Ghana. The US midterm elections yielded some extraordinary women as winners. Kyrsten Sinema is the first openly bisexual (and first woman) senator from Arizona. Deb Haaland and Sharice Davids are the first Native American women to be elected to Congress, while Rashida Tlaib and Ilhan Omar are the first Muslim women to be elected to the lower chamber. And 29-year-old Alexandria Ocasio-Cortez is the youngest woman ever to win a seat in Congress. In addition to the fundamental reasons that favour females in governance, these women were also voted in because of their platform calls. These included ending sexual violence and gun violence, defunding US Immigration and Customs Enforcement (ICE), providing Medicare for All, raising minimum wages, calling for housing as a human right, immigration reform, debt free higher education, overcoming obstacles faced by Native Americans at voting time, subsidising early childhood care and education, and protecting the Obama era immigration policy to defer deportation of anchor babies born to illegal immigrants. THE DIRTY GAME So why is this ‘pink wave’ gaining momentum in the world and how does it impact the global community? 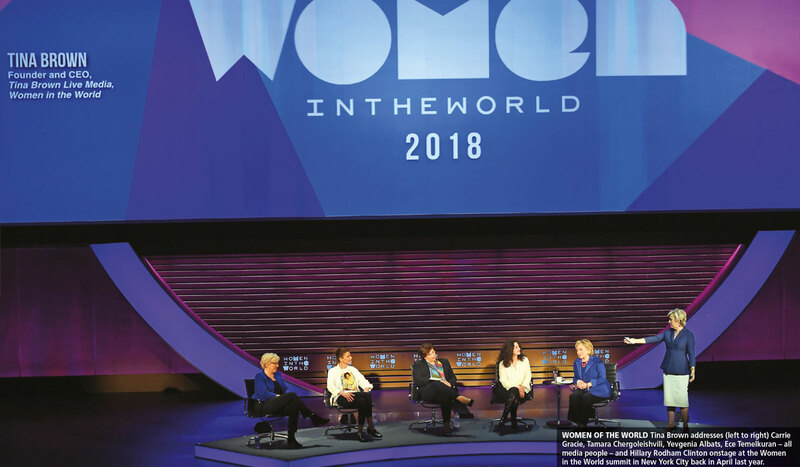 A document titled ‘Impact of Women’s Participation in Decision Making’ notes that many women in developing countries preferred not to come forward for election to high office because they consider politics to be a dirty game. The regular use of illegal and unethical means by men to win elections has resulted in women pulling away. In order to truly transform the core values of society in terms of good governance, a tokenism displayed through the appointment of a few women to government is certainly not sufficient. What’s needed instead is a critical mass generated from among the general public demanding an agenda of change. SOCIAL DEMAND So it is necessary for women to break through that glass ceiling and vie for high office if the social demand is for change in society’s core values. Moreover, women in government will result in manifold advantages, which cover a range of areas that will benefit not only their domestic constituents but also the world at large. The research into the impact of women in government is extensive but there are some common findings. In addition to the advantages of having women in governance, and their obvious impact on gender equality and equity, there’s also a bearing on peace and security. IMPACT OF PINK In an article published in pri.org titled ‘The Real Impact of a Female President – More Women in Politics,’ the writer quotes research findings and says that the likely use of violence when faced with an international crisis is inversely proportional to the percentage of women in parliament. Similarly, more women in parliament means fewer human rights abuses like political imprisonment, torture and disappearances. Women generally prefer diplomacy to war. On average, they’re less likely to support military force to settle scores since they are more conscious of the human costs of war and humanitarian fallout. So the chances for greater global peace are higher with women at the helm. And as defence spending reduces, women in government will focus more on education and healthcare – issues that lie at the heart of peaceful and secure nations. Overall, women tend to place a higher value on equality among ethnic and minority groups, and thereby reduce the marginalisation they face. It is believed that as the critical mass of 40 percent of women in a legislature is reached, the possibility of threat or attack on other states nears zero. Less testosterone translates into less aggression. Though history has seen a few hawkish women leaders like Indira Gandhi, women on the whole seek non-confrontational means to problem solving. There are no guarantees that women leaders will not become corrupt. But by virtue of their aims to improve the socioeconomic lives of their citizenry, the likelihood that their regimes will work for social rather than personal gain is greater. So it is possible that as the pink wave gathers strength, and more women gain confidence to enter politics and government, the chances of there being a more peaceful world order will increase proportionately. In a world where women are given equal rights as men, it is important that more women are represented in our parliament. However, in the present election system there is no place for women unless they are spouses or relations of the politicians in power. The professional and academic women should be given a fair share by the constitution (around 30% at least) and the family members of ruling politicians should be excluded. Can’t say I agree with some of the conclusions as they are biased but there is depth here. The pink wave is described very well and yes, more women must play their part in politics. Can’t agree that this will lead to a more peaceful world. If you take the recent chaos in Parliament in Sri Lanka, one or two women were at the forefront of the rioting mobs who call themselves Ministers. We just need decent people to represent in Parliament and it doesn’t matter whether they are men or women. That is my view, but what the writer says may hold true in some countries. Anyways, may the pink wave gather strength! Agreed, we need much better people in the parliament. Also agree with this comment.